In today’s world, people — particularly young people — are continually finding and adapting new ways of communicating electronically to fit their needs. Case in point: 2015 marks the first time Pew Research Center has asked specifically about mobile messaging apps as a separate kind of mobile activity apart from cell phone texting. And already, according to a new survey, 36% of smartphone owners report using messaging apps such as WhatsApp, Kik or iMessage, and 17% use apps that automatically delete sent messages such as Snapchat or Wickr. Both of these kinds of apps are particularly popular among young adults. 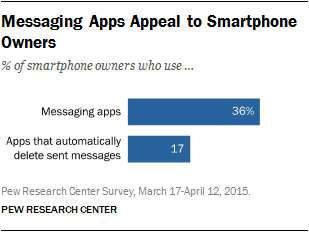 Half (49%) of smartphone owners ages 18 to 29 use messaging apps, while 41% use apps that automatically delete sent messages. These apps are free, and when connected to Wi-Fi, they do not use up SMS (Short Messaging Service) or other data. Furthermore, they offer a more private kind of social interaction than traditional social media platforms such as Facebook or Twitter. The results in this report reflect the noteworthy and rapid emergence of different kinds of communications tools serving different social needs. These new tools add to an already complex and varied terrain of online and mobile interaction. Overall, this survey found that 85% of adults are internet users and 67% are smartphone users. Throughout this report, analysis is largely based on these groups. The proportion of online adults who use Pinterest and Instagram has doubled since Pew Research Center first started tracking social media platform adoption in 2012. 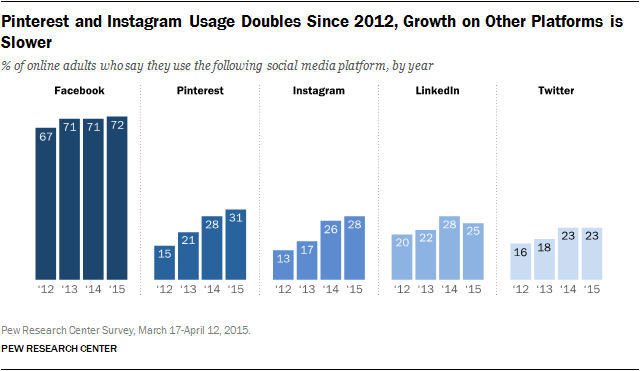 Some 31% of online adults use Pinterest (up from 15% in 2012), while 28% use Instagram (up from 13% in 2012). However, none of the social media platforms measured in this survey experienced a statistically significant increase in usage between September 2014 and April 2015. Facebook remains the most popular social media site – 72% of online adults are Facebook users, amounting to 62% of all American adults. Growth on the site has largely plateaued. There has not been a significant change in the overall share of users since 2012. Those on Facebook remain highly engaged with 70% saying they log on daily, including 43% who do so several times a day. Some 15% of internet users read or comment in discussion forums such as reddit, Digg or Slashdot, while 10% use the blogging website Tumblr. Young adults are particularly likely to use both Tumblr and discussion forums more generally, and men are more likely than women to participate in discussion forums online. The analysis in this report is based on telephone interviews conducted March 17, 2015 through April 12, 2015 among a national sample of 1,907 adults, 18 years of age or older, living in all 50 U.S. states and the District of Columbia. 672 respondents were interviewed on a landline telephone, and 1,235 were interviewed on a cell phone, including 730 who had no landline telephone. Of the full sample, 1,612 are internet users. The margin of sampling error for results based on the full sample is plus or minus 2.6 percentage points. Because many items were based on half samples, results based on internet users in this report have a margin of sampling error of either plus or minus 3.9 percentage points or plus or minus 4.0 percentage points. Results based on smartphone owners have a margin of error of plus or minus 4.6 percentage points. See the Methods section at the end of this report for more details.